Creativity can be very messy! What does yours look like? Over the past ten years, I have had a wide variety of places to create. The largest was a basement studio about the size of my current tiny home. Then, working as a Craft Editor, I had a nicely furnished loft space followed by a smaller, but well organized open office space. Since we moved back to my hometown, we've been renting a small (but adorable) little house. That has meant my craft workspace is really anywhere I can find to create. 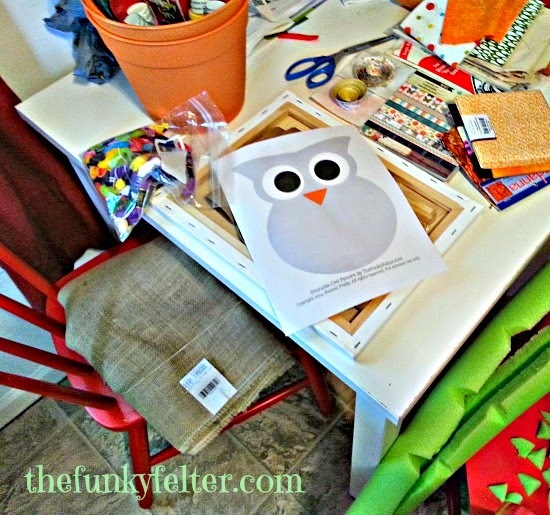 The photo above shows a varied pile of craft supplies for upcoming Autumn themed projects from a wreath to wall art to some pots for my (also tiny) back porch. That is my (also tiny) kitchen table. I have lived in bigger places and smaller places, apartments, houses with fenced yards and the like. Through several moves and cities, both big and small, I have created everywhere I have gone, usually daily, if not weekly. It is not the space, it is truly the maker. I think that kind of applies to life as well.